Whether from home, in the stands, or over the radio—Americans love their sports. Today, part of that All-American sports experience involves big data and new immersive technology like virtual reality (VR) to draw in more fans and improve gameplay. 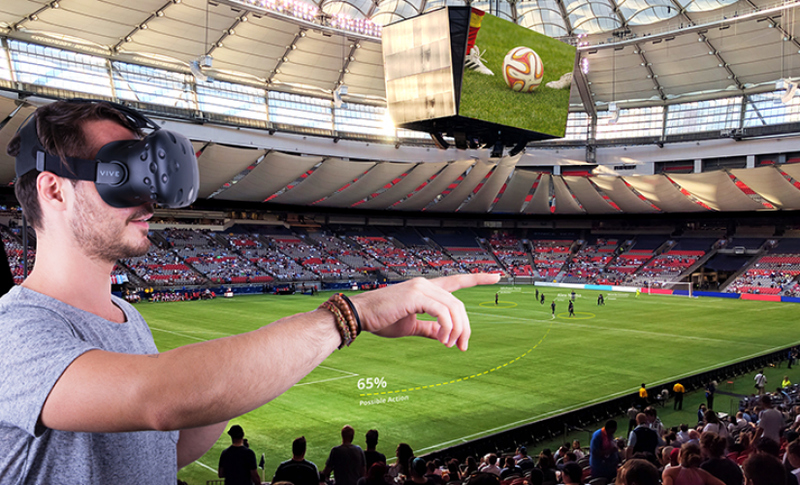 There are dozens of ways sports teams can use data to their advantage—and both fans and players alike can benefit from advances in VR technology. Here are 4 reasons that big data and VR are starting to play a key role in professional sports. How many people do you know who have VR headsets yet? Probably not many, but that’s sure to change as the technology becomes cheaper and more readily available. With this shift, VR technologies should become more popular amongst fans and athletes, with many industry insiders believing that the VR market could grow to $30 Billion by 2020. One key to making VR devices more popular on the market is creating more VR content, which is just what Samsung and the NBA teamed up to do in 2015. In 2015, the VR was still more exploratory, but the league has become confident enough in the quality that they have offered one VR game per week as part of the NBA League Pass. Partnering with NextVR, the league streams high-quality VR immersion—and reviews indicate it’s worth the hype. One reviewer even got annoyed when a waiting player blocked his view—just like being courtside! When it comes to top athletes, an incredible number of factors play a role in their overall performance, as well as the performance of the team as a whole. Thanks to the Internet of Things (IoT), coaches and trainers can now monitor players’ health and stamina in revolutionary ways. With sensors, cameras, and other equipment available that can be used during training, coaches can record vital data that can be analyzed and used to make strategic decisions for developing lineups, creating plays, and even revealing ideal calorie intake for optimal performance. With so many great teams vying for a spot in the playoffs each year, these little insights can give a competitive edge. Teams have been using video for years to help players review important plays, but VR introduces so much opportunity for safe training, especially in contact sports like football. Young players can use the technology as a “playbook”, while other players can review their own plays, or learn new ones. It helps players stay safer, since they can “practice” dangerous plays off the field. Some NFL teams are using this technology, but college teams are also seeing great success, with Stanford’s quarterback Kevin Hogan’s completion percentage jumping from 63.8% to 76.3% after using STRIVR VR training. As VR progresses, more options and interactive features will become available to fans. One eagerly-anticipated development is the advent of VR through players’ eyes. The hope is that one day, fans will be able to see the action from the perspective of their favorite players, further immersing them in the action on the field. Smart wearables are being developed quickly for professional sports, with many artificial intelligence features, cameras, sensors, and more, which could be used in a better VR experience. Currently, the NFL does not allow sensors and trackers in games, so they’re only useful during training. However, there are signs of change that indicate the future may be quite different, and more welcoming to big data on the field. FIFA has begun to relax these rules, allowing players to use wearables during matches. The NFL may not be far behind, since the NFL Players’ Association recently teamed up in a five-year partnership with WHOOP, a wearable that helps players monitor their bodies, and how much stress they’re putting themselves under in training. Big data is slowly but surely becoming one of the biggest players in professional sports—and this is just the beginning.